An 11-year-old African-American boy is being charged with a hate crime in connection with a fire which was lit on a Jewish school bus in Brooklyn. 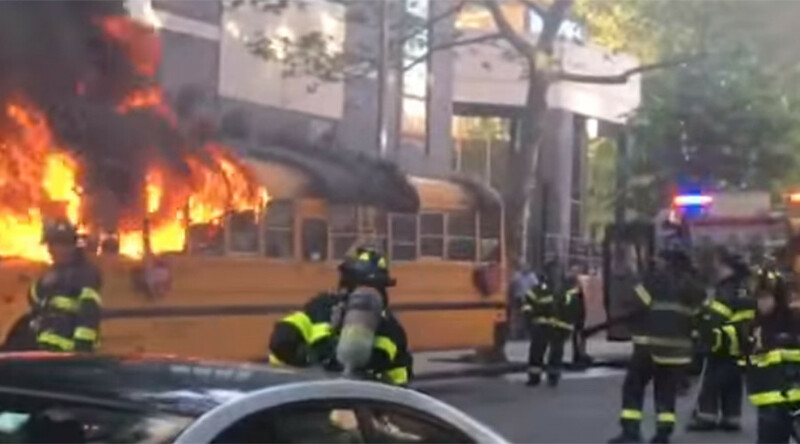 The bus had been parked in front of the Beth Rivkah Hebrew School for girls when a group of children set fire to it. A surveillance tape released by CrownHeights.info found that approximately seven children had been involved with the arson incident on Sunday. The video shows several children boarding the bus – which had been left open and unattended – with pieces of cardboard in hand. The kids rush out as flames appear in the front of the bus. So far, only an 11-year-old boy has been arrested in relation to the crime. He is currently facing hate crime charges, despite the lack of Jewish writing on the bus. He has been charged with criminal mischief as a hate crime and arson as a hate crime. The attack took place in Crown Heights, Brooklyn – an area notorious for its history of tension between the Black community and the Jewish community. Chani Klein, a parent at Beth Rivkah, told the New York Daily News, “It’s terrible,” and added, "I don't know why they would do that. Maybe they were just bored, or maybe it really was about hate. Either way they blew up a bus. They need help." However, not everyone believes that the children were motivated by hate. Tensions in Crown Heights have been simmering for a long time. In 1991, they boiled over when a rabbi’s motorcade ran a yellow light, hit a car, got on the sidewalk and knocked a 600-pound pillar onto two children. Gavin Cato, 7, was killed instantly, but his 7-year-old cousin, Angela Cato survived with serious injuries. After the children were hit, the driver of the vehicle was removed from the scene by a private Hasidic ambulance while the children were left for city workers to remove. This resulted in the three-day long Crown Heights riot that cost one Orthodox man his life. In the 25 years since Cato’s death, tensions between the communities in Brooklyn have not eased up. On Friday, the New York Daily News found that a 2013 assault on a gay black man by a Jewish security patrolman was closed early by the NYPD. Taj Patterson, a 25-year-old black man, was walking in Williamsburg, Brooklyn when he claims that a gang of men attacked him while shouting homophobic slurs. Patterson was left permanently blind in one eye after the attack, but within 24 hours, the police had classified it as a misdemeanor and closed the case with no arrests. The case was only reopened after Patterson’s mother, Zahra Patterson, discovered that the case had been closed. She reportedly reached out to friends with media contacts until the story made the news. Investigators reached out to her only days later. So far, five suspects have been indicted on a felony gang assault charge. Charges against two of them have already been dismissed, but the other three are set to appear in court sometime next week. Unlike the 11-year-old, none of them are facing hate crime charges.